Be sure to visit the historic coastal town of Augusta if you're planning a trip to Western Australia. 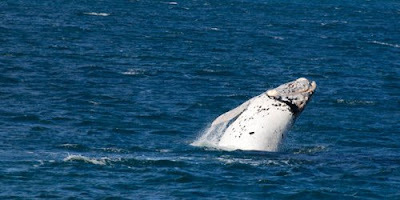 This is because it's the temporary home of an albino Southern Right Whale calf and its mother. They are expected to hang around in Flinders Bay at least until October before venturing down to the chilly feeding waters of the Southern Ocean for the summer. The calf weighed two tonnes at birth and will end up weighing about fifty tonnes when it reaches adulthood. Local news and Naturaliste Chartes, a whale watching company, held a contest to choose a name for the hypomelanistic cetacean. 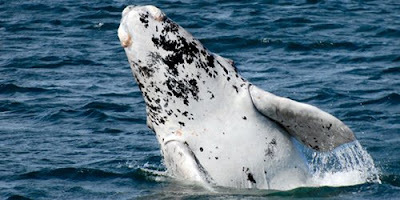 The Western Australian Noongar tribe picked the winning name: Wilgi Manung, which means - appropriately enough - White Whale. 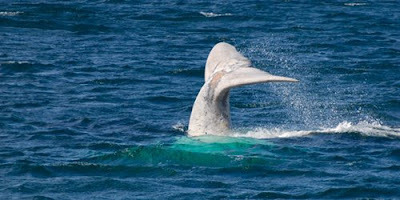 Wilgi Manung is one of only ten albinistic whales known. According to conservation officers, the whale does not totally lack melanin and is therefore not a true example of albinism. Rather, it shows reduced pigment and is an example of leucism, similar to the famous white lions of southern Africa. Wilgi Manung is expected to go grey with age (but not to be confused with a Gray Whale). Right Whales are fat. Nearly 40% of their body weight is blubber. They were therefore considered the "right" whales to hunt: they float when harpooned and can easily be hauled in from the ocean. After years of successful conservation efforts, the Southern Right Whale was recently moved to Least Concern status on the 2008 IUCN Red List. The North Atlantic and North Pacific Right Whale species, however, remain Endangered. Photography credit: for more photos and info, visit PerthNow. 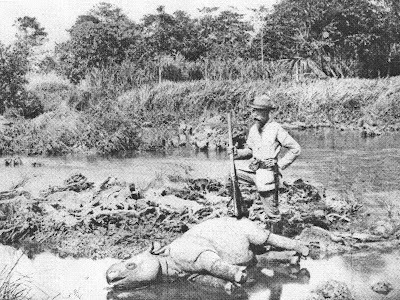 The Eurasian hunter Charles te Mechelen photographed with a young Javan rhinoceros in Ujung Kulon, Java, in 1895. What I'd like to know is: as things change, do we stay the same? Image: The Rhino Resource Center.